The fronts of the plenum and cold air drops in this case are wider than their sides; it’s why an installer made these complicated transitions. You can purchase a tutorial on how to make them below. Plenum extension luckily was the same size and in order to adapt air cleaner casing instead of cold air boot the installer used a piece of 24 x 8 duct. The plenum and cold air drops in this case were pretty big it’s why an installer used these complicated transitions. An installer in this case got out with a short and simple transition. The installer in this change-out could propose the entire ductwork replacement, but usually homeowners put down such offers – too expensive! I hope now someone would come up with a different idea. The air filter casing swung the cold air drop a bit aside. And installer saved a couple of bucks by installing case less A/C coil, but made a short transition at the bottom. The transitions in the next installation, just like in the previous ones were design to wrap duct around the air filter casing. The same ideas in these installations, but why they added that sleeve in the second installation no one would explain… And again the installer used larger than necessary A/C coil it’s why he built those transitions. For this replacement an installer completely rebuilt the plenum and supply ductwork parts, but saved the opening in the return duct. Two more examples of the air cleaner installations. Two pictures before and after installations. The cold air boot and riser in this case made by someone who doesn’t know what he is doing, but surprisingly the air is going to find its way through this system anyways! The short and simple transition for the next installation anyone can do – just purchase my tutorial below. In the before and after pictures you can see that this is already at least second change-out. Lazy idiots probable saved some money on the first one, but the eventually the second installation was done right. And again the homeowner decided to save on replacement and have all these huge round ducts exposed. 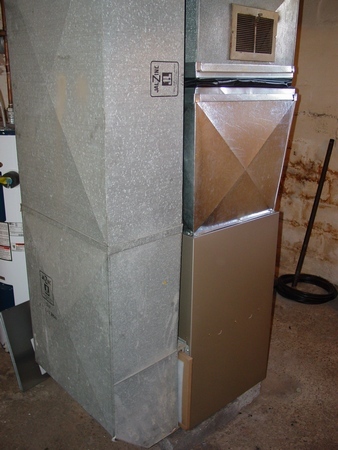 If you would like to learn how to replace a furnace, install an air cleaner casing and make all necessary transitions please purchase a chapter from my Ductwork Installation Guide and paid pages below. 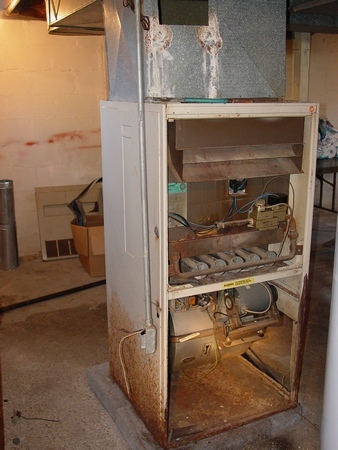 installer is suppose to know to perform a furnace replacement.